Subject : – Implementation of CCS (RP) Rules 2016 : Clarification regarding exercise of option under Rule 5. Reference :- HQrs office, New Delhi letter No AT/II/2702/Clar dated 28/04/2017. Reference is invited towards HQrs. Office communication cited above (copy enclosed), under which it has been clarified with an illustration that officials promoted or granted MACP between 01/01/2016 to the date of notification of CCS (RP) Rules, 2016 may opt to enter the 7th CPC after availing benefit of promotion under 6th CPC. 2. Further, attention is also invited towards HQrs. Office communication bearing No. AN/X1V/14164/7th CPC/Corr/Vol-l dated 16/12/2016 (copy enclosed) addressed to CDA Secunderabad with a copy to CDA, 1T & SDC, Secunderabad regarding fixation of pay under 7th CPC in light of implementation of FR 22 (1)(a)(l) vide Gol, Dept. of Expenditure (1C) OM dated 29/09/2016 for implementation those who are actually entitled. 3. In view of the above, it is requested to obtain option form and undertaking from the eligible officials fall under the issues explained vide ibid HQrs. Office communications and be forwarded to this office for further necessary action at this end. Encl : As stated above. As per this office UO Note cited above, the issue of availability of option to enter the 7th CPC w.e.f. 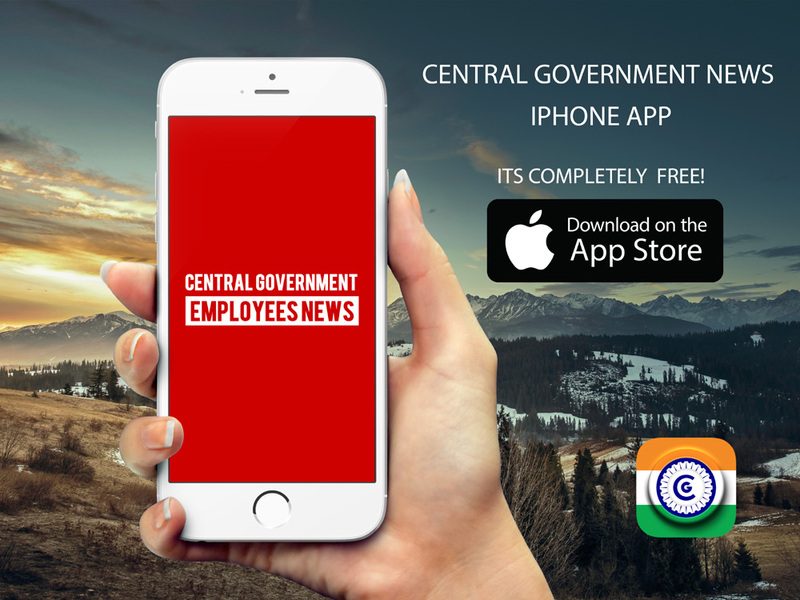 01-07-2016 (i.e., from the date of next increment in terms of proviso 1 of rule 5) to those employees who have got promotion/upgradation in a higher grade between 1st day of January, 2016 and the date of notification of CCS (RP) Rules 2016 had been referred to MoD along with an illustration (given below) of pay fixation of an employee who got financial upgraradation on 17-01-2016 in the grade pay of Rs 5400/- (PB2); MoD was requested to examine the issue and clarify the matter w.r.t. illustrative pay fixation. 3. Now MoD/ D(Civ-I) has intimated that the illustrative pay fixation as provided above seems to be correct and in consonance with the provisions mentioned in CCS (RP) Rules, 2016. 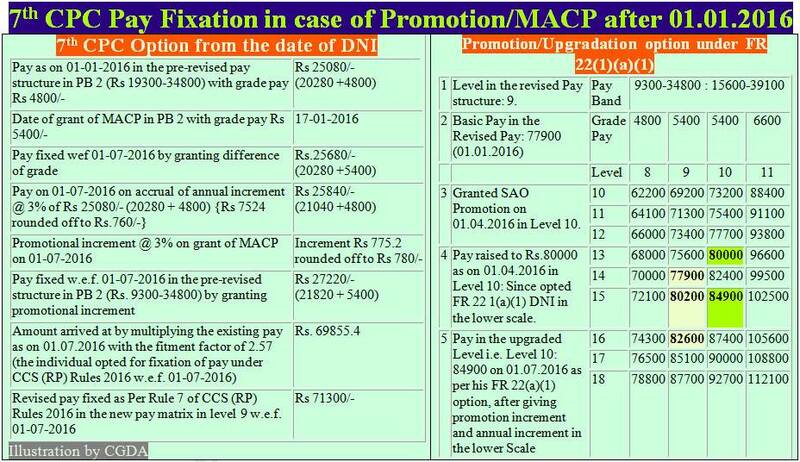 Subject: 7th CPC Pay Fixation – Tulip – publicaction of Pt.II.O.O. – Reg. The pay fixation-proposed at Annexure A of your letter cited under reference in respect of Sh. A.K. Banerjee SAO was examined in the light of extant provisions orders on the above subject and it is intimated that based on the information provided by your office, the methodology adopted seems to be correct. Further, the GoI, Dept. of expenditure (IC) OM dated 29.09.2016 and provisions of FR 22(i)(a)(1) are also self explanatory to deal with such cases. 2. In the light of above, it is requested to take up the issue with CDA IT & SDC also for making necessary amendments/provisions in TULIP Programme in line with the methodology shown in Annexure A of your letter to avoid any discrepancies in pay fixation. Action taken report in this regard may be intimated urgently alongwith copy of the Pt.II O.O. for pay fixed under rules. This has the approval Sr. Dy.CGDA(AN). Letter No. No.AN/Pay/5005/PF/2016 Dt. 22.11.2016. 7th CPC Option : 01.01.2016.